In the late 17th century, Anne, 3rd Duchess of Hamilton, envisioned a "Grand Design" for the estate surrounding Hamilton Palace. This would be one of the most ambitious projects in the country, befitting the lands belonging to the premier Dukedom in Scotland. Her grandson James, 5th Duke, took up her plans and engaged the services of William Adam to design the magnificent hunting lodge known as Chatelherault. A site was selected near 12th century Cadzow Castle along the Avon Gorge. Situated on a hill adjacent to a medieval hunting forest, it would afford ample opportunities for hunting, relaxation, and entertainment in an elegant setting overlooking Hamilton Palace and the town of Hamilton. Work began in 1732 and was completed by 1744. Over the centuries, though, Chatelherault was abandoned and neglected, falling into a state of considerable disrepair. Subsidence of the soil occasioned by coal mining resulted in tilted floors. Restored as part of a Country Park by the Hamilton District Council, the lodge and grounds are now open to the public. Visible in the distance, beyond the vast clearing where an ancient breed of cattle grazes, is the Hamilton Mausoleum. Alas, Hamilton Palace is no longer visible. Subsidence of the land from coal mining resulted in weakening of its foundations, and it was demolished in the 1920's. However, many treasures from the Palace were transferred to the present family seat at Lennoxlove, where they may be viewed by the public on some days. Adjacent to the hunting lodge is a museum which depicts life in Hamilton during the 18th century. One exhibit shows coal miners crawling through narrow tunnels, grumbling about the tyrannical Duke of Hamilton. The museum shop offers visitors a chance to acquire a variety of memorabilia, including Chatelherault shirts and trays. 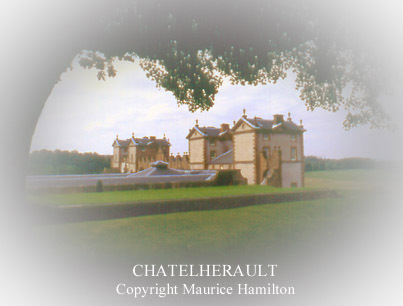 Persons interested in the present appearance of these historic grounds may wish to view my Photo Album of Chatelherault.